Suitable for 1 1/4"-4" tube I.D. These cutters are used to remove the hard deposits from the Curved or Straight boiler, air heater, economiser etc tubes. These spring loaded cutters are used to remove the hard deposits from the Straight evaporator, juice heater, etc tubes. Suitable for 1 1/2"-4" tube I.D. Suitable for 2"-4" tube I.D. These cutters are used to remove the hard deposits from the Straight tubes. Pivoted arm of cutter swing out by centrifugal forces & it clean every part of tube wall. 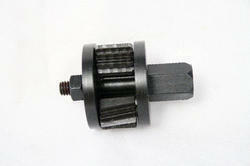 Looking for Sugar Mill Cutter Head ?